DEMAC SRL, Tömlők - nemvasfémek, hydraulic equipment, oil-pneumatic components, az EUROPAGES oldalakon. 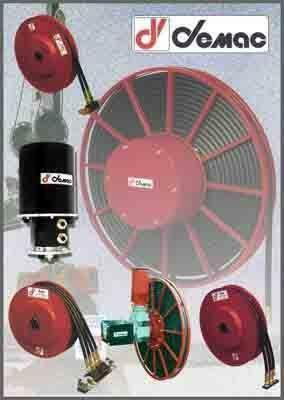 Demac designs, manufactures and sells hose reels (hose reels for single, double and triple hoses, from 1-way to 6-way, combined hose and cable reels, air hose reels) and cable reels (reels for power and signal transmissions, combination swivel joints, hose and cable stoppers). 200 basic models with 1000 variations to cover all applications. 200 basic models with 1, 000 variations to cover all applications.